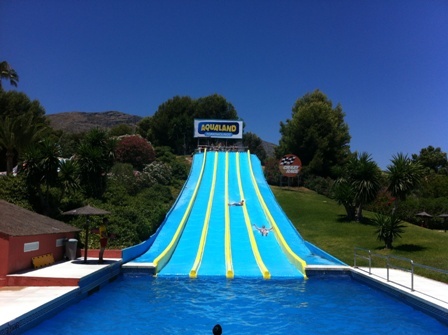 Some of the most popular attractions for tourists visiting the Costa del Sol during the hot summer months are the Water Parks. 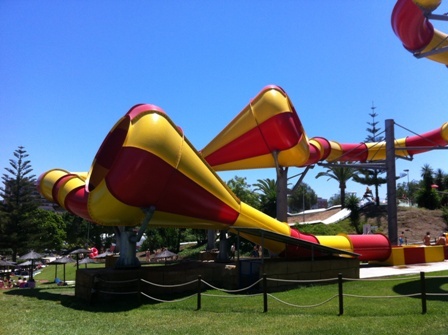 There are two located within easy driving distance from Sunset Beach Club; however, today we’re going to feature the Coast’s biggest water park: Aqualand! 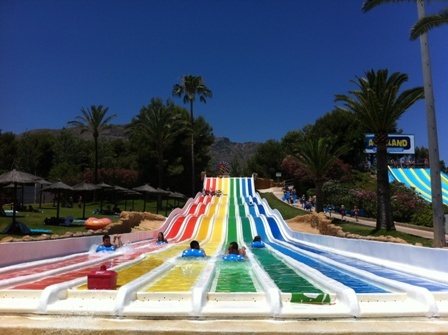 I can’t believe I’ve lived on the Costa del Sol all my life and have never actually been to Aqualand (Shame on me!). From the minute I set foot in the park, I realised that I – and especially my kids – had been missing out, big time! My first impression was a feeling of openness and cleanliness. The place is spotless and the use of green areas and the natural landscape make for a relaxing and inviting atmosphere. With such a popular attraction, one my biggest worries was that it was going to be overcrowded and – dare I say – claustrophobic! Nothing could be further from the truth. All the rides are well spread out with vast areas of garden in between; these areas come equipped with sun umbrellas and are perfect for setting up camp for the day. 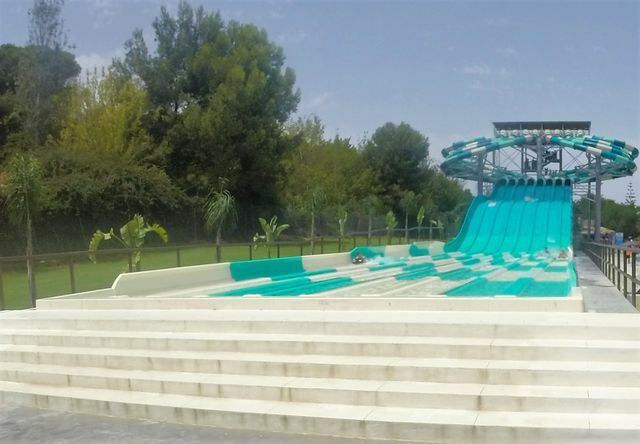 If you prefer a little more comfort, there are plenty of sun beds located around the main Wave pool and a special picnic area; they can be rented for €4 per day. We visited on a Saturday in the month of July, in other words, high season and I was worried that it would be overcrowded; however, with the exception of the customary queues on a few of the more popular rides, it was remarkably civilised and, more importantly, highly enjoyable! Concerned about security and safety? Don’t be. There are lifeguards everywhere and all the ones we dealt with were extremely friendly and helpful. You are allowed to bring your own food and drinks into the park, as long as there are no items made of glass. This is what we did, and by the looks of things, so did most of the families; however, next time I might be tempted to eat at one of the impressive restaurants within the water park. If you’re looking for snack food, burger, pizzas etc then you won’t be disappointed as there are various outlets spread throughout the park. 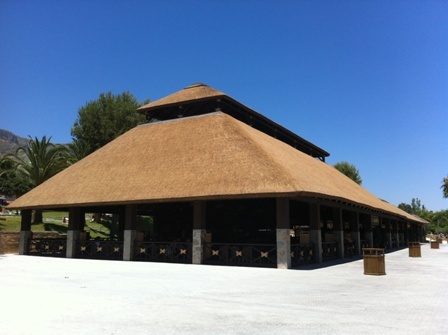 If you prefer something a little more elaborate, the impressive main restaurant located under a massive thatched roof (see photo above) offers both an a la carte option and a buffet style option with pastas, grilled meat and fish, pizzas and lots of wonderful desserts. The place was spotless and I even managed a peek into the kitchens which were equally impressive with all staff immaculately dressed in their stylish uniforms. Rent a safety deposit box to keep your valuables safe. There are security guards patrolling around the park but use of these safety boxes will just give you peace of mind. It’s €5 for the day plus a refundable €5 deposit. 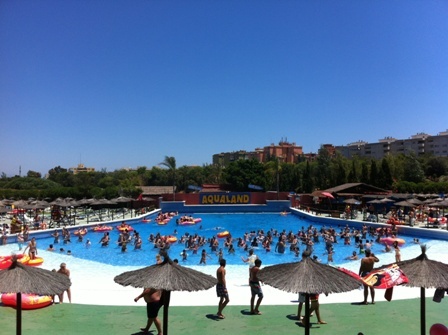 This year Aqualand has introduced a new ‘Fast Pass’ system which allows users to save time by not having to queue up for inflattable rings (donuts) and special mats for some of the more popular rides. Having a Fast Pass also allows you to join special queues which are given preference on many of the rides. It costs €12 per person for the day and although it makes the day a little more expensive, I found it to be worth the money for the time saved. If you don’t want to spend the extra money on a Fast Pass, you can still enjoy all the rides, just know that you’ll be spending quite a bit more time in queues. Make sure your kids have plenty of suntan cream as it’s easy for them to get burned. If you’re looking to save a few euros, be sure to take a picnic for your lunch, just make sure you’re not carrying any glass bottles or items (the guards will check at the entrance). The Speed Racer is the newest ride at Aqualand (Opened in July 2016) and, as the name suggests, is an exhilarating and adrenaline pumping experience! 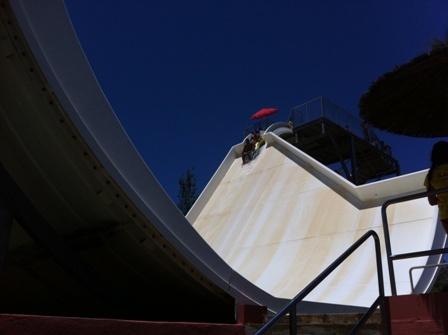 The start of the slide involves twists and turns in the dark before shooting out onto the final slalom lanes. You’ll be lying on special mats for this ride, equipped with special handles which you’ll be grateful for! I have to say it was probably my favourite ride and the fact it has 8 lanes means the queues are pretty quick too! This is a new attraction with 8 lanes which you shoot down using a carpet-like float. Really good fun and another of the rides which young kids (have to be taller than 1.20m) can use on their own. Another great advantage is that the queue went very fast so no long wait times. This is one of the most popular rides amongst the adult contingent; fast with lots of speedy turns! This is officially the highest water slide in Europe (22 metres) and definitely one for adrenalin junkies… Steep drop and really fast fall! 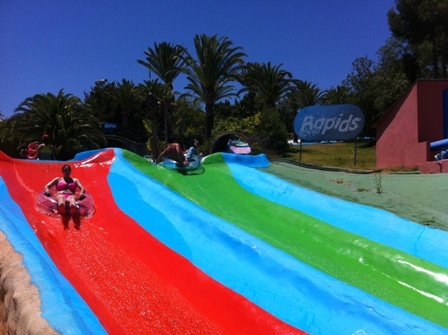 The name says it all… You’re pushed over a steep drop whilst sitting in a rubber ring only to head straight back up the other side of this U-shaped ride. Quite a popular ride with average queues and wait times (quicker if you rent your own rubber rings). 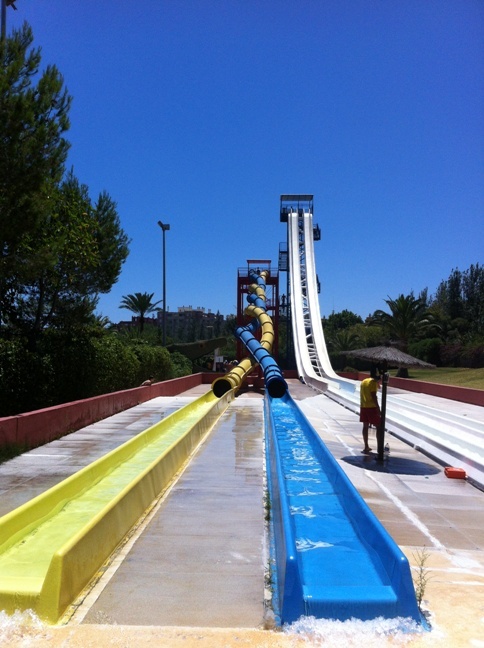 3 long slides in zig-zag… which one are you going to choose? 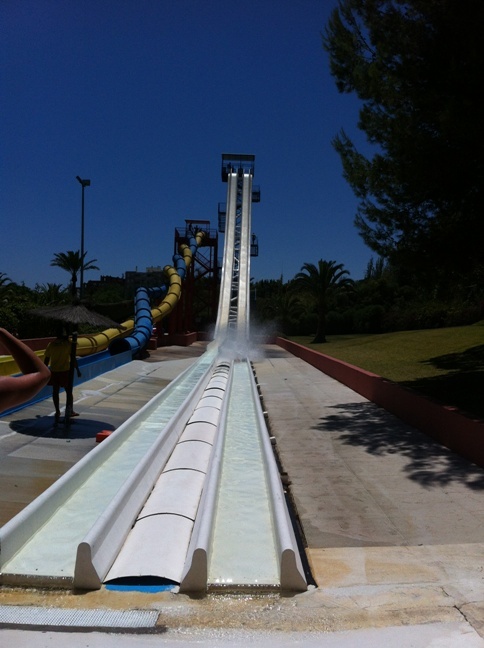 This slide doesn’t look like much at first site; however, when you are on it you literally fly down! Great fun 🙂 Also a good option for younger kids. This is a fun ride for all the family. It’s like going rafting down a river… not scary at all. Again, if you’ve rented a rubber ring, you won’t have to wait as long in the queue. More than 100m of twists and turns… in the dark! Highly recommended but expect quite a long wait in line. There are 3 areas dedicated to younger children: Tropical Lagoon, The Water Mushroom and Children’s paradise. 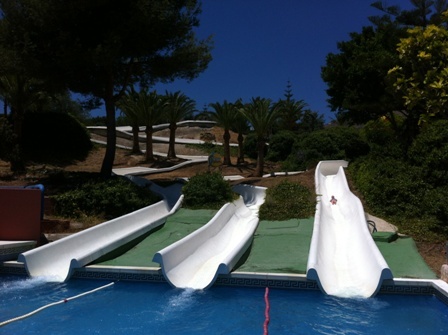 All have a great selection of kid friendly slides which will keep the little ones happy for hours. So what do you think? Looks like fun doesn’t it? 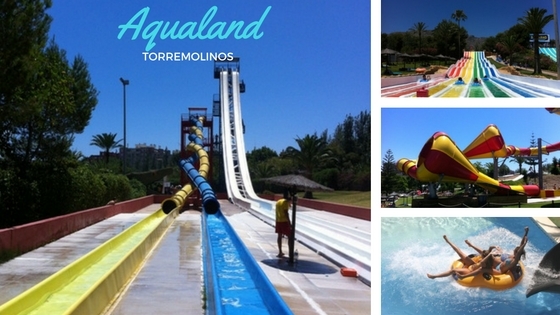 We hope you enjoyed the review of Aqualand in Torremolinos; we definitely recommend it for a fun family day out. 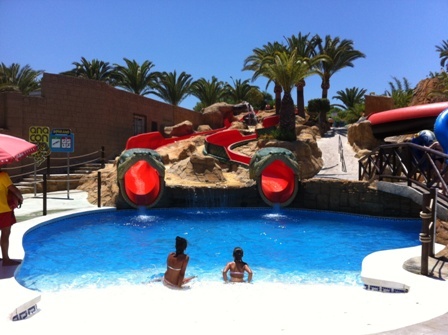 Don’t forget that you can buy tickets to Aqualand from our leisure desk on the 6th floor of the hotel. Looking for a hotel to stay nearby? 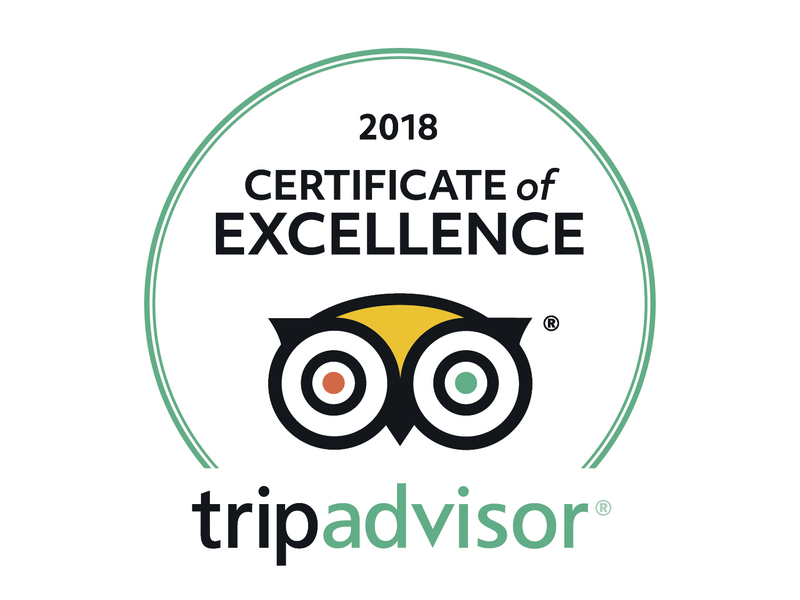 Check out our website at www.sunsetbeachclub.com … we’ve got fantastic apartment style accommodation, great facilities and a fun entertainment programme for a great family holiday. Hi Elaine, we’re not sure if they have a family pass but they are constantly doing offers. If you are staying with us, best thing to do is ask at our leisure desk when you arrive. when in October does the park close for winter? CAN YOU BUY A DAY PASS AT YOUR HOTEL ? When does the Aqua Park Close? Hi Gemma, I’m afraid Aqualand closed last Sunday for the season as it’s getting a little chillier here. Sorry. I’m afraid we don’t offer day passes to our hotel Gemma. The bars and restaurants are open to outside guests but I’m afraid the pools are only for guests who are staying in the hotel. hello. Will aqualand be open Oct 29th and 30th this year 2016? Hi Catherine, I’m afraid Aqualand closed for the season las weekend and wont be open til April/May next year. Sorry. Thank you. What can my 17 yr old and 14 yr old do for the week (from 28th Oct)? Any tips? Tk u! Yes, the entrance prize allows you to go on all the rides. If you don’t want to wait in long queues, you have the option of buying a fast pass which is an extra charge. Hi. Can U send me the address please. Don’t understand, its in Sunset hotel ir no? Hi Aija, no, it’s not at Sunset Beach Club. It’s approximately 10 minutes by car in Torremolinos. Will you be open from 23rd to 29th October this year? We’ve checked on their website and it seems it’s open all of May but best to check with them directly. I don’t think it’s open in April Andrew… Best to check directly with the waterpark but I think the weather is too unreliable at that time of year. 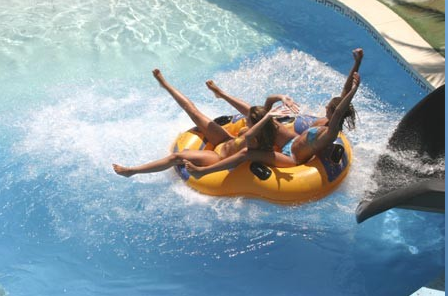 If I buy a ‘Friends Pass’ to Aqualand is it just for entry on one day or can I go a few times over my holiday? Not too sure what you mean by ‘Friends Pass’ Sarah. As far as we are aware they only sell daily passes. Best to check on their website to make sure. Hi Lucy, I’m afraid Aqualand doesn’t open until the end of May. Sorry.